This rice dish from the Indian subcontinent is amenable to whatever spices and proteins you have on hand. 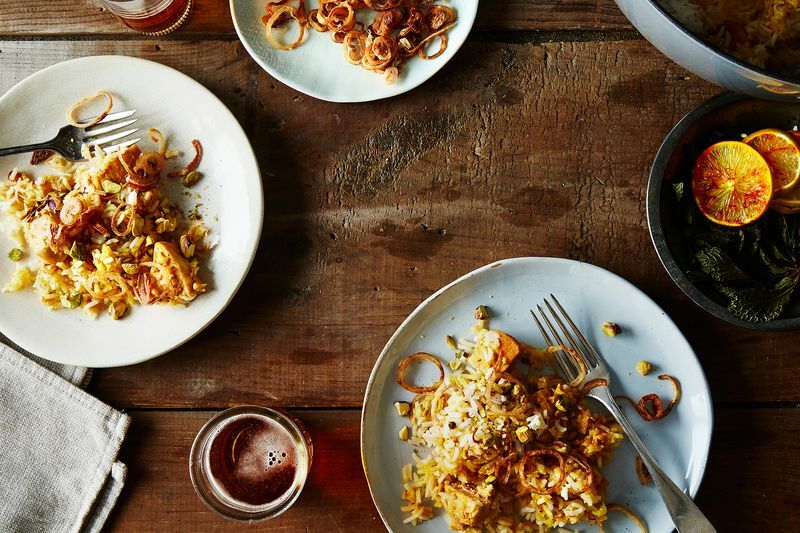 Growing up in a Pakistani home where all the women of the family held their biryani techniques close to their hearts, I had a romantic notion that it—a rice dish with spices, vegetables, and/or meat—was a written recipe that passed on like an heirloom, never to leave one’s bloodline. As I got cooking, I discovered that making a biryani is more about mastering techniques instead of a recipe, created by estimation and instinct. The first step to demystifying and opening up the possibility to making your own biryani is understanding what it really is. A biryani is simply a layered curry and rice, infused with fragrance that comes from steaming flavors together. Think of a biryani as a marriage of comforting rice, rich fragrances of spices, and the best quality meat, poultry, or vegetables. 1. 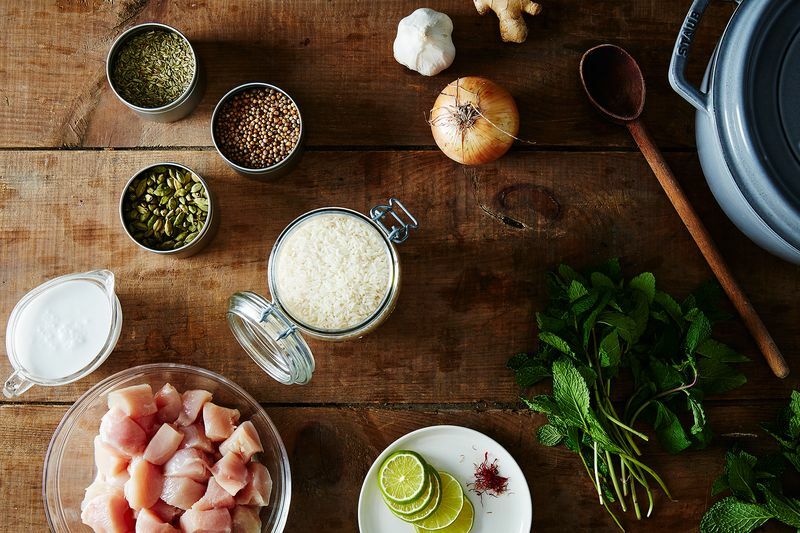 Make your own spice blend. The first step to infuse spices in your oil, next to create a root vegetable base, and finally to make your main curry base. 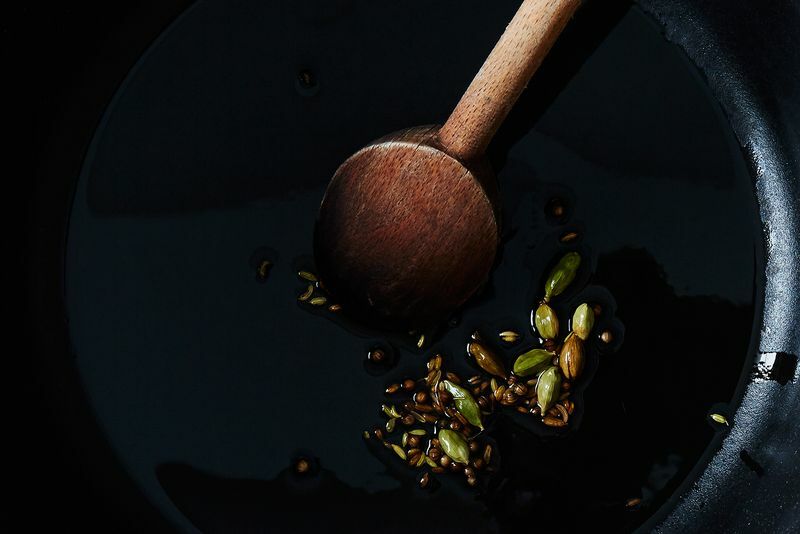 Oil should be about 1 tablespoon to 1 teaspoon of spice, so if you’re using say one star anise, I would use 1/2 tablespoon oil, 1 inch cinnamon to 1 tablespoon oil. Always try to use an oil that is not heavily fragranced itself, so preference would be a simple sunflower or corn oil. Start with making a spice base by heating oil in a heavy-based saucepan with a tight-fitting lid; the pan should be 5 to 6 inches in diameter for a biryani that’ll serve 4 to 6 people. Once it’s hot, add a selection of whole spices that you like; let that be your flavor combination—keep it simple or complex. Usually, warm smoky spices such as star anise, black cardamom, or cinnamon are great with red meats. Cooler spices such as coriander seed, green cardamom, and aniseed work best with poultry or seafood, while cumin and bay are the best partner spices with vegetables. 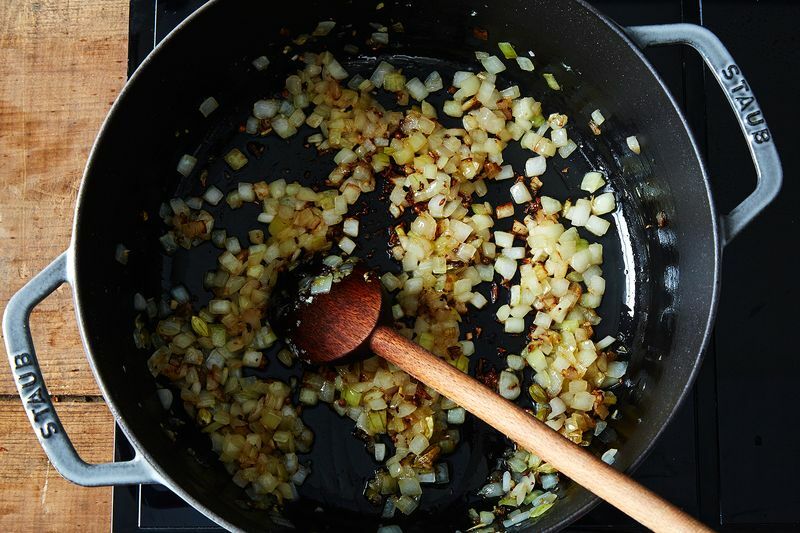 Chop or blend some onion (any type), ginger, and/or garlic. Add them to the pan with the spices and cook until light brown. Do not make them too dark as a burnt onion base will carry through your entire biryani. Now pick the main aromatic base to make your curry sauce. 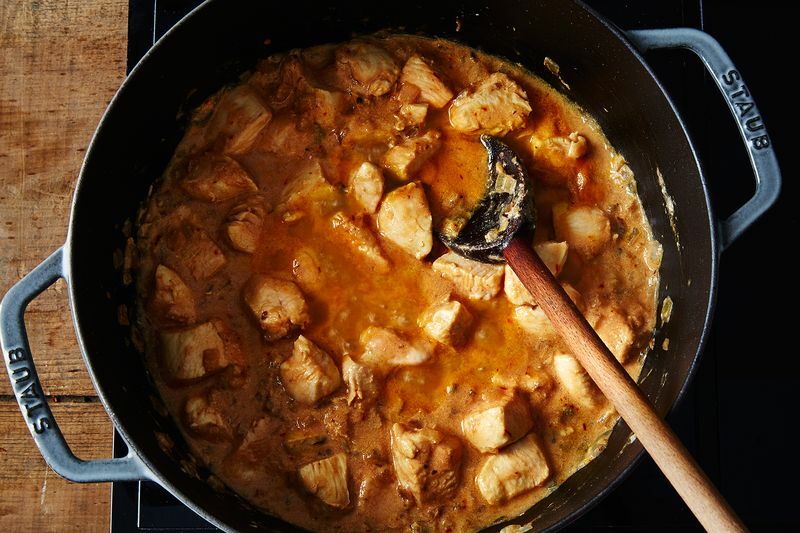 Tomatoes or yogurt or coconut milk are good options as they can slowly infuse with the spices from the oil through slow cooking; try to stick with using one base for your curry as too many conflicting flavors will confuse the final flavor of your curry. 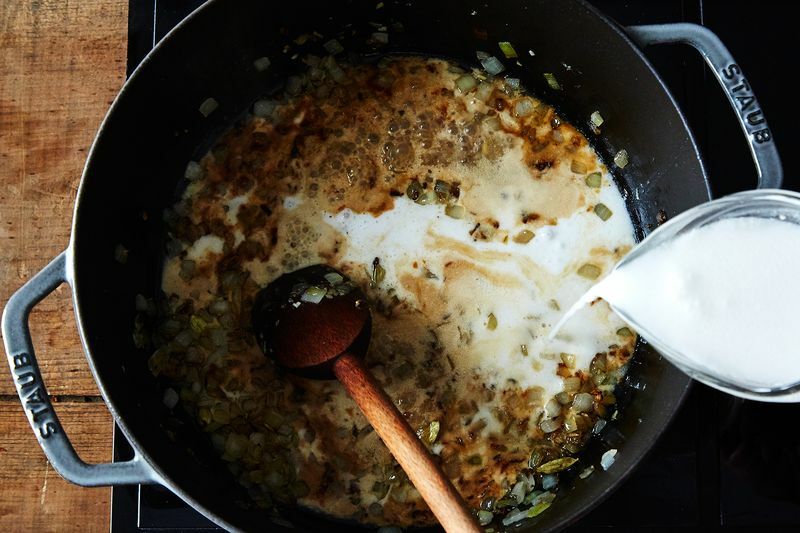 Add the liquid to your pan with the spiced and root mix and simmer for 15 to 25 minutes to cook down the liquid. Patience will have its rewards. 4. Choose your hero ingredients. You are now ready to add your hero ingredients, be it beef, mutton, seafood, or vegetables. The meat can be added raw, in 1 inch sizes, with or without bone. Adding bone with meat is traditional as it add an additional stock to the curry base during a slow cook. Fish can be added in large pieces, shellfish raw and unshelled, and vegetables in larger pieces so that they do not disintegrate during steaming and cooking. Cook until the ingredients are cooked through, the sauce is thick, and oil is rising to the top, anywhere from 20 to 30 minutes. 5. Layer it with the best rice. Use par-cooked basmati to layer over the cooked curry. To par-cook rice, boil it in salted water for 2 to 3 minutes, then fish out a couple grains. If they’re firm and break into two pieces, then it’s par-cooked. If they break into 3 to 4 pieces, then it’s fully cooked and you’ll need to start again. My only stipulation is to use the best variety of aged basmati—pure white and long grained. The quantity should roughly be enough to cover the curry evenly and completely or, as my mother taught me, in equal weight to the curry! 6. Pick your additional flavors and steam. Pick the fragrances and/or colors you wish to infuse into your biryani. Whatever you pick will steam through the whole dish and touch upon all the other flavor combinations, so pick something that compliments rather than clashes. I love using saffron, lemon or lime slices, mint leaves, and a trickle of melted ghee, which goes well with red meats. 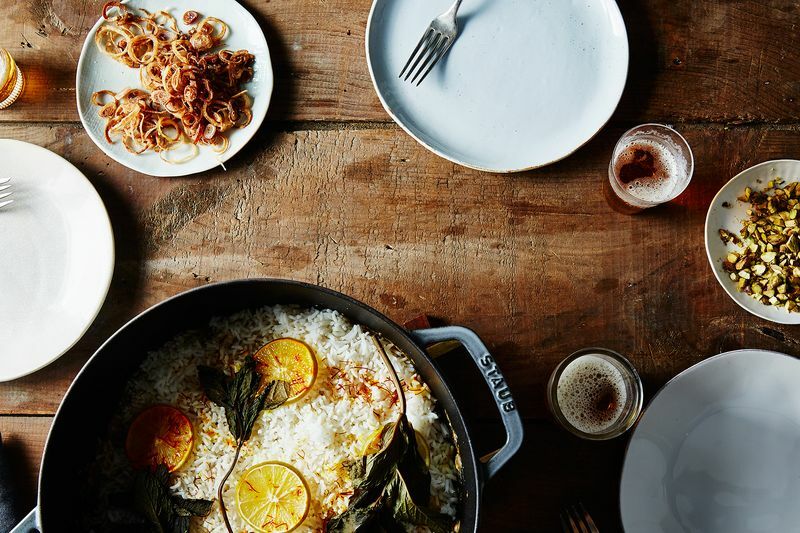 For a poultry biryani, saffron, lemon, and mint leaves fit in nicely. For a vegetable rendition, I like cilantro, aniseed, and nutmeg. For seafood and white fish, try saffron and mint or rosemary. Once you have done this, you need to seal the aromas within the pan. Place a piece of foil over the saucepan and top it with your lid, creating a vacuum to seal. Turn the heat to very low, simmer for at least 10 minutes. Resist the temptation to open. You will know when it is time to open the lid—when the kitchen is thick with the fragrance of spice and aromatics. 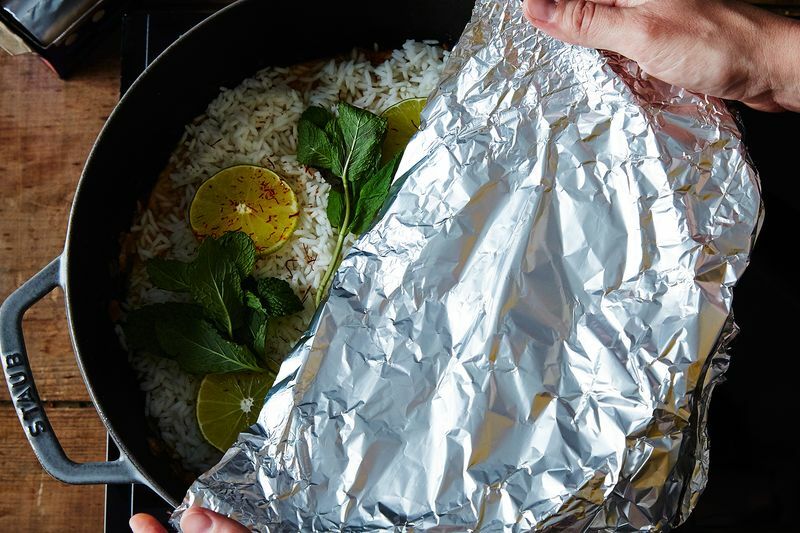 Turn off the heat and prepare for the grand finale: As you lift the foil, steam should rise to reveal perfectly cooked rice peeping through; don’t shove a big wooden or steel cooking spoon into the rice, as that’ll break the grains. Instead, using an ordinary tablespoon, starting from the side, gently mix the bottom layer with the top. Before serving, garnish with anything you want to add a final texture. For me, it is pistachios, browned onions, pomegranate, and rose petals. Jasmine flowers, roasted almonds, and sour cherries would also be great. As a mixed ethnicity American with no heritage from the continent of Asia, I really enjoyed the flexibility and simplicity of this recipe. I have had biryani a few times and loved it. Thank you for the spice combination suggestions, they smell delicious simmering in my kitchen. My only bummer is that I had to add more spices after adding my liquid because it was not flavorful enough. Adding a liquid to spice ratio would be helpful. Can't wait for dinner tonight! Sad to see 'indian' coopting the tags and category of a Pakistani cook sharing the food of her Pakistani heritage. Anyone with more than a cursory understanding of the subcontinent's foods knows there is variance between those two, and a layer deeper, that even those two buckets are gross oversimplifications. thanks for your feedback - if you follow my blog or my recipes online, my cookery classes in the UK (and soon my forthcoming book) you will see that I focus quite individually on Pakistani food and totally agree, the layering of Pakistani style food is different - I am a great advocate of my homeland's cuisine and have worked hard to differentiate it through my recipes and articles that have been widely published. However, this article here was merely giving someone keen to create a biryani, simplifying the essential cooking techniques, styles and ideas to create something of a lay-man's biryani - so as to use the ancient style (which is not isolated to Indian or Pakistani cuisine, but crosses over Persian ,Arabic, Middle Eastern cookery ) the idea of layered rice with cooked curry/sauce. So therefore, without going into more detail, this article was a simplification, not an authentic Pakistani or Indian biryani recipe - the 'tags' in the article as for the basic cook who wants to understand a general concept of biryani, therefore Indian or Pakistani or sub-continental works for people searching - but if you wish to learn my authentic ones either attend one of my classes in the UK or read my book soon! good luck. Additionally, R (I don't know your name sorry), I do not personally do the 'tagging' of post, Food 52 do does judging from their most searched options I would imagine. Thank you. Enough to cover the meat/poultry whatever you are using. Just enough to cover the top. Does that make sense? Any tips for making a true "dum" biryani? The technique you've described is reminiscent of a kachi biryani which, while tasty, isn't what I struggle with in terms of cooking. Yes indeed. But this is a quicker more time saving recipe but does tastes pretty good. I think you'll have to wait for another post on my family recipe for a real dum biryani!! Wouldn't the fish or shellfish overcook if you add it and then cook for an additional 30 minutes (20 minutes in step 4 and at least 10 minutes in step 6)? The key is to work the time. For seafood I would recommend making the curry base completely, just about cooking the rice prior and then adding the raw seafood onto the curry, top with nearly cooked rice then add aromatics and steam ok very low heat for about 5-7 mins. That should do it! Good question! !